In the same black, poisoned vein as "Dogtooth" and "Funny Games" pumps Alex van Warmerdam’s "Borgman," another darkly comic thriller about domesticity crumbling into violence and even insanity. Like a religious parable designed to present more questions than answers, "Borgman" can sometimes frustrate but it is an accomplished piece of work, driven by a uniquely malevolent tonal balance and two fantastic central performances. It sometimes simmers when I wish it would boil over but damn if it isn’t fascinating to watch the water bubble. "And they descended upon the Earth to strengthen their ranks." After that unsettling biblical quote, van Warmerdam opens with a series of equally unsettling images as an old-fashioned hunting party heads into a wooded area with spears, a barking dog and a shotgun. I should mention that the gentleman carrying the firearm is a priest. They’re clearly after something evil and that something lives underground. Having crafted himself a home under the Earth (or perhaps born there as some sort of demon), lives Camiel Borgman (the fantastic Jan Bijvoet). He escapes the hunting party and alerts two fellow earth dwellers—Richard (Jeroen Perceval) and Ludwig (the director himself)—that they must move on as well. Is Borgman just a homeless man? Why were people trying to kill him? Why does he live underground? What is he planning next? What ranks? Did he "descend upon the Earth"? "Borgman" is one of those films in which questions pile up much more quickly than resolutions, which leads to a growing sense of unease that only strengthens as Borgman and his mates enter suburbia and bodies begin to pile up. Borgman knocks on the door of Richard (Jeroen Perceval) and Marina (Hadewych Minis), the heads of a seemingly normal family, complete with children and a regular nanny (Sara Hjort Ditlevsen). All Borgman asks for is a bath. Can a well-spoken, seemingly harmless homeless man get clean? When Richard balks, Borgman claims to know Marina. She denies it but the first crack is already in place in this relationship before he’s even in the house. Richard confronts the tramp on his front step, beating him brutally. When Marina later finds Borgman hiding in the garage, she takes pity on him, in no small part because he’s been injured by her husband. She lets him stay in hiding in the house. And Borgman knows how to hide, often having to say "I’m here" because no one actually hears him come in. He borders on supernatural in the way he smoothly slides in and out of the family home, and he begins to influence Richard, Marina, and their children. "Influence" is one word for it. 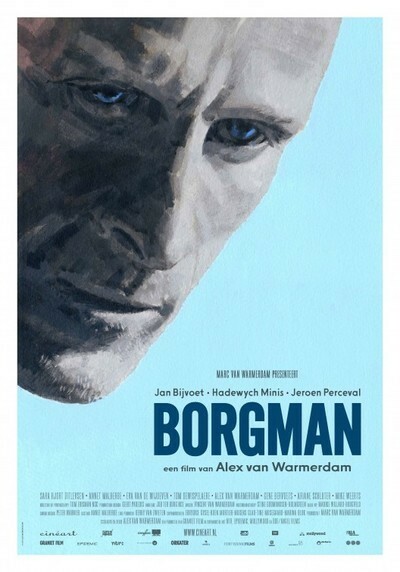 Where "Borgman" goes from here, I won’t spoil, but it takes a turn from what you might presume is a simple domestic thriller to something much stranger when Borgman’s crew gets heavily involved in what one could only describe as the takeover of an upper-class family. Van Warmerdam is clearly commenting on class issues, countering Borgman’s tramp status with the wealth on display in the world that he increasingly manipulates. However, the social commentary of "Borgman" feels like background more than thematic centerpiece. Van Warmerdam is way more interested in mood, malevolence, and the general sense of unease that permeates every frame of "Borgman." To start asking too many questions about Borgman’s background and purpose is to lose focus on the more tonal joys to be held here. There is malice, darkness, and true evil potentially hiding not just within every knock at the door but at the family dinner table. It only takes a catalyst to reveal it. At almost two hours, some of "Borgman" feels a bit too cinematically deliberate—purposefully opaque without meaning at all, even tonally. There were times when I wanted to "get on with it" and I'm not sure the destination satisfies as much as the journey. However, frustrations are few and far between, thanks in large part to the riveting work by Bijvoet and Minis as the drifter and the woman he claimed to know when all he needed was a place to take a bath. Or did he? CIFF 2015: "The Red Spider," "Schneider vs. Bax"